The one thing that gets a huge chunk of my time two times a week. More than my friends, more than just about anything else. One of the reasons that I am behind on so many projects. Just me and the machine. Spending a ton of quality time. 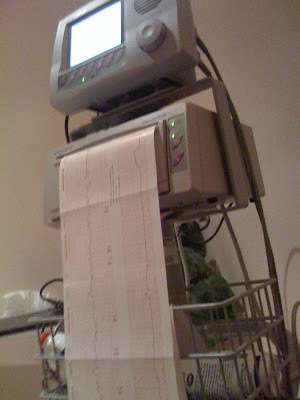 Listening to baby's heartbeat and clicking her wild movements. Can't find me? I'm not answering my phone? Chances are I am rocking a non-stress test. All while nestled in the extraordinary comfort of a mauve pleather recliner. We only have a few more meetings. Until then, thanks for helping take care of my little girl! I had very bad gestational diabetes and had weekly appointments with the NST as well :) Even though it took so much time, it was never boring to me. I LOVED hearing that heartbeat. Hi...you don't know me, but I too spend two days a week with that lovely machine. I had high blood pressure prior to this pregnancy (a few days after delivering my first daughter), so just started these last week. Oh so fun :) Glad to hear I'm not alone! Hmmm...so I had no idea you had to do these tests so often!! Goodness!! Have you read some books during your QT with the NST?!! Oh, I feel your pain, Julie....me and that machine got real cozy when I was preggers, too. Hang in there!